Ok – I just like the picture. Not a gay male attendant in sight and all the female ones dressed in shorts similar to the ones I potter around the garden in. A Flying Sporran Chauvanistic Travel Advisory. From February next yeart you will be able to fly to Saigon (Ho Chi Minh City) from Bangkok on Vietjet which has quite a nice ring about it. The first flight takes off on February 13th which to the well informed is the first day of the New Lunar Year, so, according to the blurb, perfect timing for Vietnamese, Thai and foreign travelers planning to celebrate by travelling abroad during this festive season. 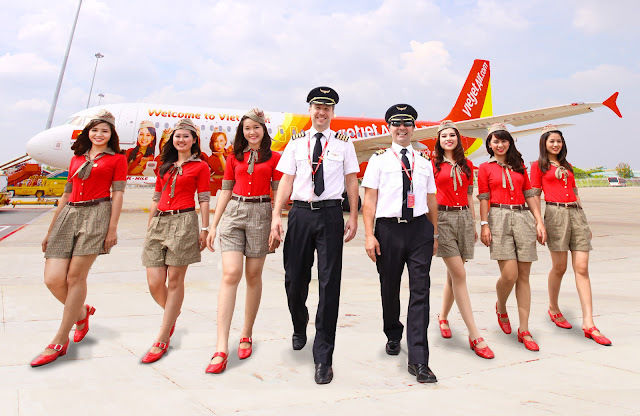 “The route will start off with round trip per day initially with VietJetAir’s newly acquired Airbus 320. The one hour and 30 minute flight will depart from Ho Chi Minh City at around 11am and return from Suvarnabhumi Airport at 1:30pm”. I won’t be on the flight unfortunatelty. Chinese New Year and Songkran are the times I hunker down and keep my head well below the parapet. Okay that’s enough of that. But welcome Viet-Jet. I’ll try you the next time I have to pay for my own ticket.